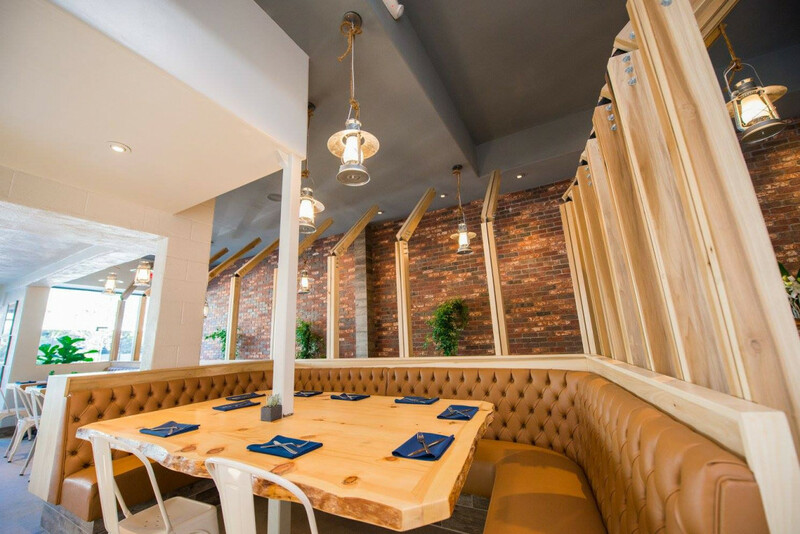 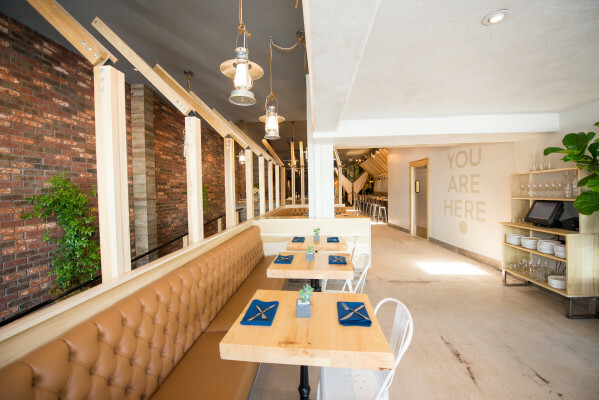 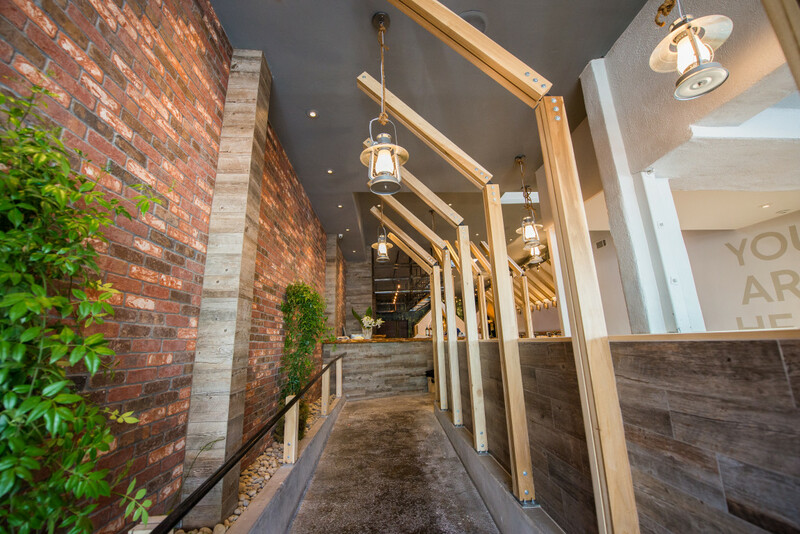 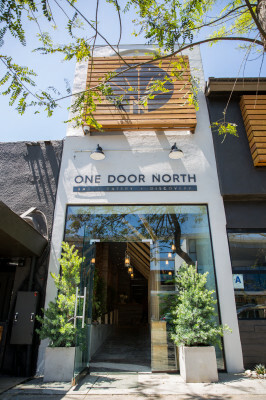 One Door North is a 5,000 square foot bar and eatery that offers casual dining in an urban oasis setting. 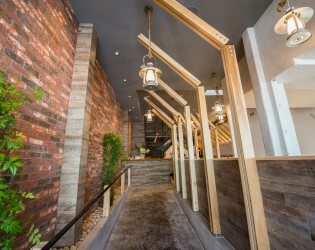 The interior is woven together through rustic elements of wood, steel and brick, with decorative outdoor accents that serve as centerpieces throughout the space—the idea is to bring a raw, natural destination into the heart of a thriving urban hub. 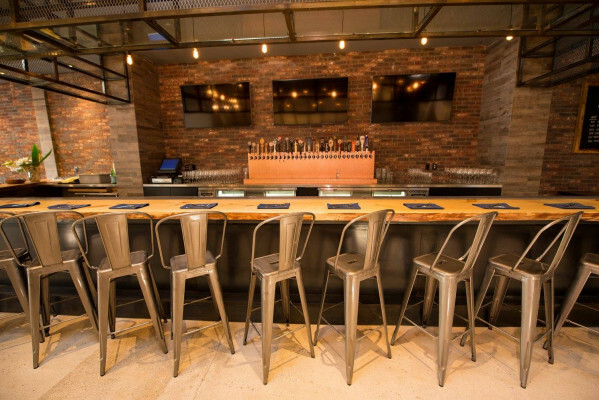 One Door North is a 5,000 square foot bar and eatery that offers casual dining in an urban oasis setting. The interior is woven together through rustic elements of wood, steel and brick, with decorative outdoor accents that serve as centerpieces throughout the space—the idea is to bring a raw, natural destination into the heart of a thriving urban hub. One Door North playfully pays tribute to the concept of discovery with subtle nods to the great outdoors, wanderlust and adventure. There is seating for up to 140 people in three distinct dining areas: an airy street-facing front section with banquettes and hand painted mountainscapes on the wall; a central bar with high-top seating and multiple flat screen TVs; and a back section which features three 11 ft. tall safari-style canvas tents that serve as dramatic semi-private dining spaces. 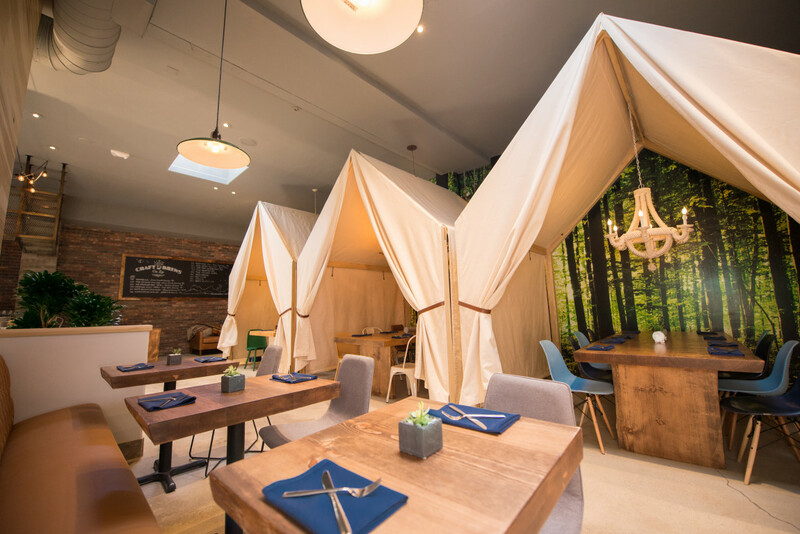 Each tent is flanked by a back wall covered in floor to ceiling graphics of forest imagery and can accommodate groups of six to ten, or can be connected to create one linear dining room for larger parties. 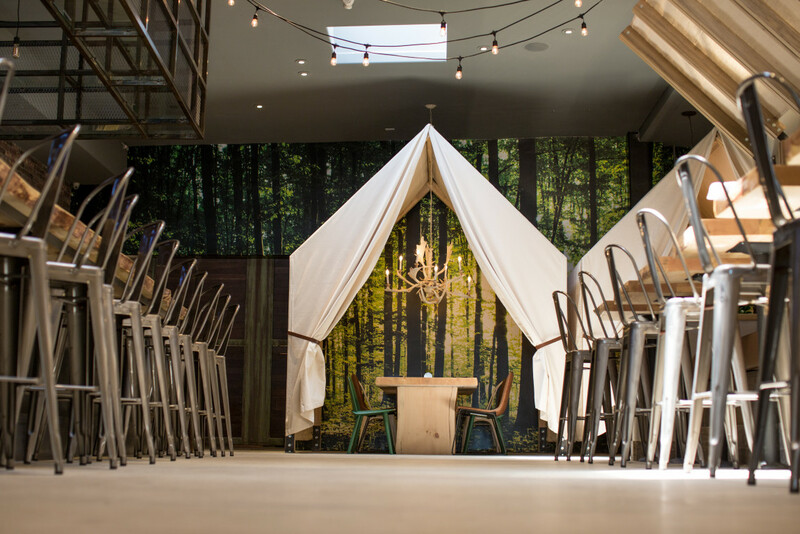 Each canvas tent also features a unique theme, drawing from the mountains, coasts, and lakes the Piehl family has visited over the years. 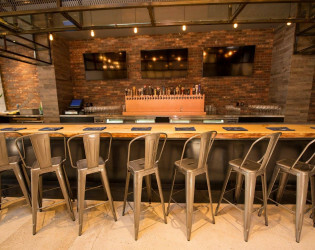 All areas feature beautiful hand-carved, live-edge wood tables from a sustainably logged forest in Wisconsin, including the bar top, which gives a cohesive feel to the entire space. 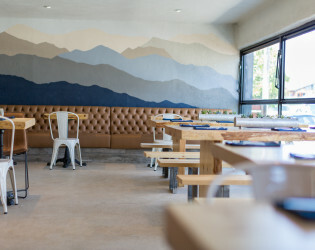 not including tax and 23% service charge. 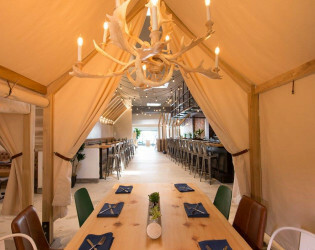 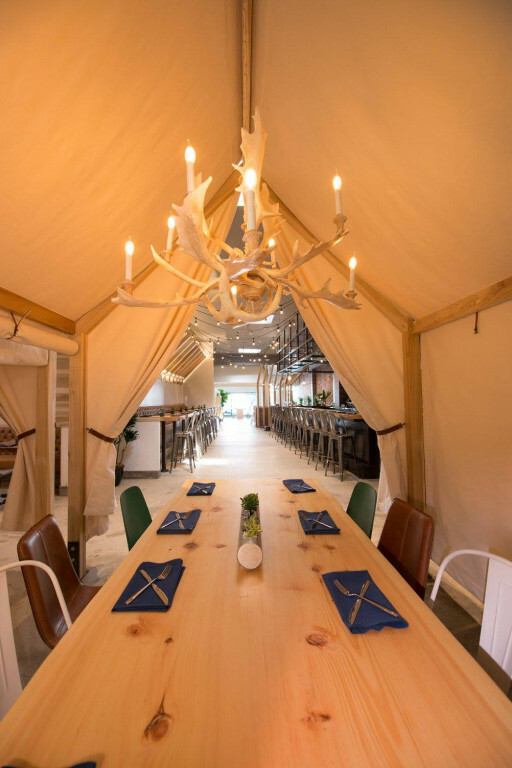 Three 11 ft. tall safari-style canvas tents serve as dramatic semi-private dining spaces. Each tent is flanked by a back wall covered in floor to ceiling graphics of forest imagery and can accommodate groups of six to ten, or can be connected to create one linear dining room for larger parties. 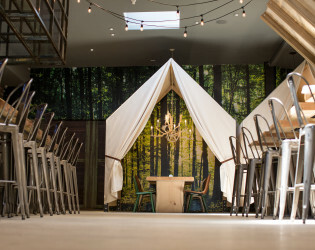 Each canvas tent also features a unique theme, drawing from the mountains, coasts, and lakes the Piehl family has visited over the years. 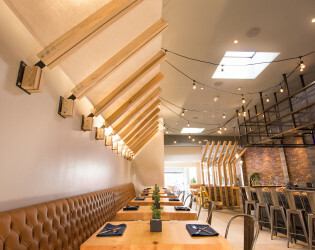 The Bottle Shop, tucked into the back of the restaurant, features a selection of 100 of the best small producers both domestic and abroad, while also offering The Smoking Goat’s namesake private label wines: white, rosé, and red from the small, family owned Chateau de Gravieres winery in Bordeaux, France. The Bottle Shop is organized by the geographic areas from which the wines come - coasts, rivers, mountains and valleys - and tells a story about how these locations shape the identity of the wines grown there. 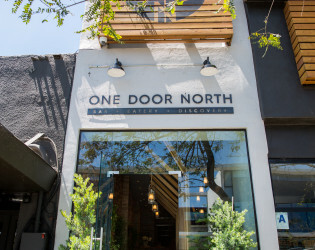 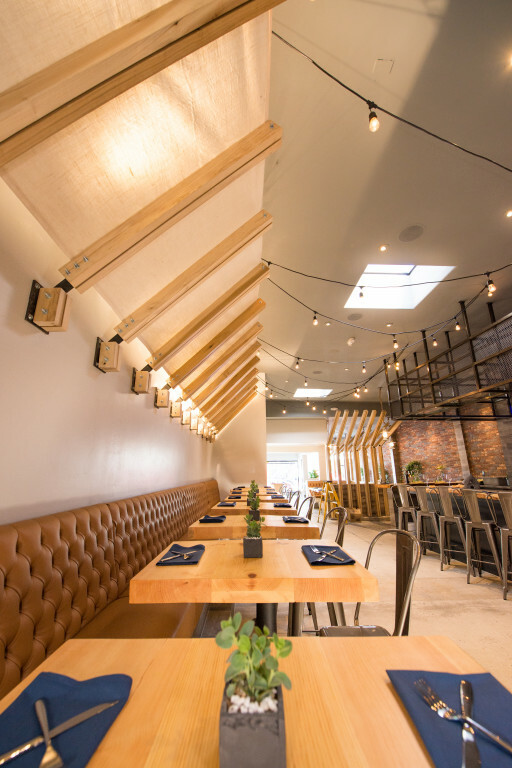 One Door North pulls inspiration from the venue’s overarching concept of discovery and the great outdoors, with Executive Chef Fred’s menu drawing from influences throughout the United States, offering dishes that are both familiar and unexpected, no matter where guests may call home. 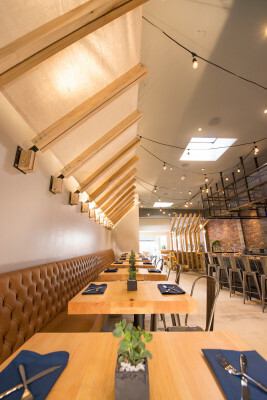 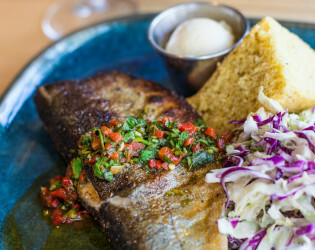 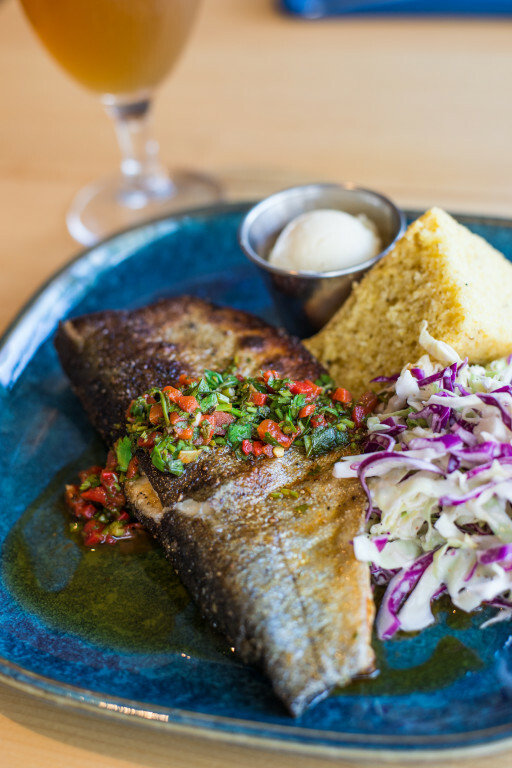 Entrees such as campfire trout, slow roasted tri-tip steak, are complimented by produce-forward small plates including local beet and butter leaf salad with house-made farmer’s cheese, farro and farmer’s market vegetables, and a meat and cheese board. 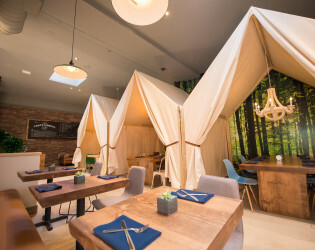 Rounding out the experience, One Door North provides diners with a playful selection of campfire dessert favorites including s’mores, farm fruit crisps, house-made cookies and more. The bar inside One Door North boasts a predominantly domestic beer and wine list, sourced from craft, boutique and classic producers—offering an expansive selection of wines, more than 20 beers on tap, alongside a selection of craft cocktails. 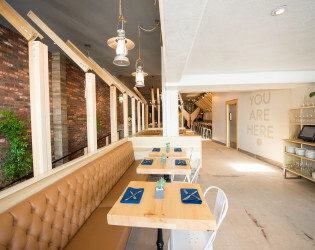 ​The Bottle Shop, tucked into the back of the restaurant, features a selection of 100 of the best small producers both domestic and abroad, while also offering The Smoking Goat’s namesake private label wines: white, rosé, and red from the small, family owned Chateau de Gravieres winery in Bordeaux, France. 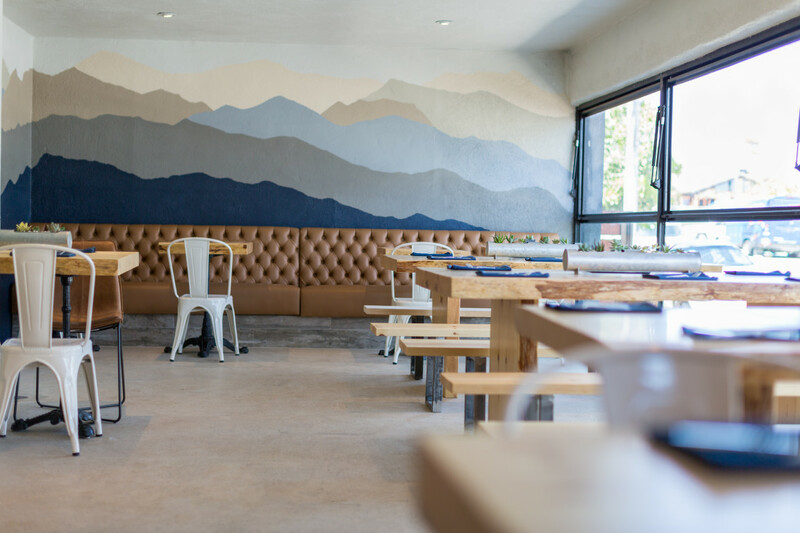 The Bottle Shop is organized by the geographic areas from which the wines come - coasts, rivers, mountains and valleys - and tells a story about how these locations shape the identity of the wines grown there. 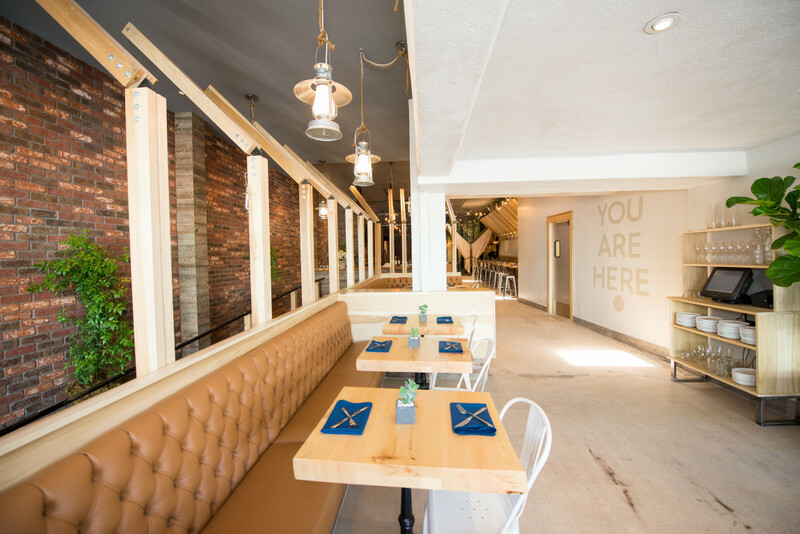 Dining room area with a playful art installation with the words "YOU ARE HERE" paying tribute to a trail map. 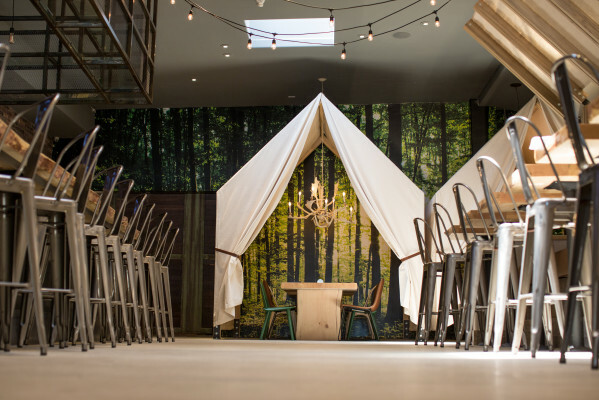 Three 11ft tall canvas safari tents with unique themes. 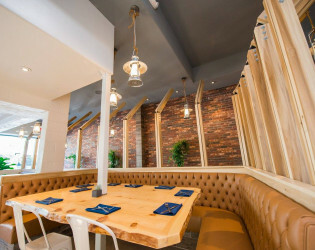 These can be joined to create a large table for private parties of 30 people.